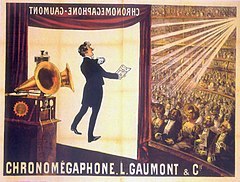 1902 poster of Gaumont's sound film exhibition. Film, movie, or motion picture, is a series of still images on photographic film which, when run through a film projector and shown on a projection screen, creates the illusion of moving images. Walter Benjamin, “The work of art in the age of mechanical reproduction,” Illuminations (1968), p. 239. British Board of Film Classification, "War is Hell...but how much can you show?" 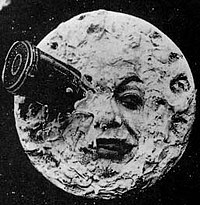 While people are always quick to take up the cudgels against censorship of the press, or radio, any crackpot can advocate new forms of censorship for the movies, and not a voice is lifted in protest. There's something illogical about this indifference to censorship of the movies. After all, it's just as much a medium of public expression as are the radio and newspapers. Jean Cocteau Esquire, (Feb. 1961). I'm going to leave you with this machine, pay attention, she's going to ask you a bunch of questions. A message I’ve been telling myself: the cinema is very conservative, and unless you have a story that satisfies you, that is within the unchallenging zone, but you love it, you can’t do it as cinema. Otherwise, you better go do it for television, which is more daring now. Georges Duhamel, Scènes de la vie future (1930), p. 52. Georges Duhamel, describing cinema, Scènes de la vie future (1930), p. 58. Sergei Eisenstein (1957) Film form [and]: The film sense; two complete and unabridged works. p. 196. Nora Ephron, writer/director, in the documentary Dreams on Spec. St. John Ervine Ney York Mirror(June 6, 1963). Federico Fellini, Atlantic Dec 1965. Federico Fellini [on the Decline of Cinema], a Fellini Lexicon, (1992). Federico Fellini, [Recipe for a Good Film], a Fellini Lexicon, (1992). When television and film are fixated on helping audiences find sympathy for troubled, selfish, cruel, brilliant men, it’s easier to believe that the troubled, brilliant men in real life also deserve empathy, forgiveness, and second chances. And so the tangible achievements one year into the #MeToo movement need to be considered hand in hand with the fact that the stories being told haven’t changed much at all, and neither have the people telling them. A true reckoning with structural disparities in the entertainment industry will demand something else as well: acknowledging that women’s voices and women’s stories are not only worth believing, but also worth hearing. At every level. Nooo! Leave that to George Lucas, he' s really mastered the CGI acting. That scares me! I hate it! Everybody is so pleased and excited by it. Animation is animation. Animation is great. But it's when you're now taking what should be films full of people, living thinking, breathing, flawed creatures and you're controlling every moment of that, it's just death to me. It's death to cinema, I can't watch those Star Wars films, they're dead things. Jean-Luc Godard, Quoted in Richard Roud, Godard, introduction (1970). [variation] Cinema is truth at twenty-four frames a second. Samuel Goldwyn Quote (Sept. 9, 1956). If you want to be a storyteller, be an author, be a novelist, be a writer, don't be a film director. Cinema is not the greatest medium for telling stories. It is too specific, leaves so little room for the imagination to take wing other than in the strict directions indicated by the director. Read "he entered the room" and imagine a thousand scenarios. See "he entered the room" in cinema-as-we-know-it, and you are going to be limited to one scenario only. Peter Greenaway, "105 Years of Illustrated Text" in the Zoetrope All-Story, Vol. 5 No. 1. Werner Herzog Werner Herzog Eats His Shoe (1980). Film is not the art of scholars, but illiterates. Werner Herzog Herzog on Herzog. As you see [filmmaking] makes me into a clown. And that happens to everyone – just look at Orson Welles or look at even people like Truffaut. They have become clowns. The culture is unchallenged as the standard setter, and the child’s sense of right and wrong and his priorities in life are shaped primarily by what he learns from the television, the movie screen and the CD player. Joe Lieberman, In a lecture at the University of Notre Dame, Awake! magazine, April 8, 2000; Are Morals Worse Than Before? Pauline Kael, "Kiss Kiss Bang Bang". Stanley Kubrick, Kagan, Norman (1989), The Cinema of Stanley Kubrick, New York: Continuum Books. Stan Lee "Why Fans Are Hating On Michael B. Jordan's Human Torch, According To Stan Lee", Eric Eisenberg, Cinema Blend, 2015. William Moulton Marston, The Secret History of Wonder Woman (2014) by Jill Lepore, p. 136. William Moulton Marston The Secret History of Wonder Woman (2014) by Jill Lepore, p. 139. William Moulton Marston as quoted in Henry W. Levy's, "Professor to Cure Scenarios with Wrong Emotional Content: Dabbled in Movies While at Harvard; Now Sought By Hollywood with Offer of Favorable Contract", New York University News January 1929; The Secret History of Wonder Woman (2014) by Jill Lepore, p. 137. If I write a crappy comic book, it doesn't cost the budget of an emergent Third World nation. When you've got these kinds of sums involved in creating another two hours of entertainment for Western teenagers, I feel it crosses the line from being merely distasteful to being wrong. To paint comic books as childish and illiterate is lazy. A lot of comic books are very literate — unlike most films. Alan Moore Independent Monday 15 March 2004. Alan Moore about the film adaptation of V for Vendetta, in an MTV interview "Alan Moore : The Last Angry Man", MTV.com, 2007. Hollywood, television and film is not my prime area of interest. Because I would never have any control, working in those areas. It’s nice to get the money from a Hollywood project, but whatever they do with it, it would be their piece of work, and not mine. Originally I was content to just simply accept the money, that was offered when people had adapted my comic books into films. Eventually I decided to refuse to accept any of the money for the films, and to ask if my name could be taken off of them, so that I no longer had to endure the embarrassment of seeing my work travested in this manner. The first film that they made of my work was "From Hell" Which was an adaptation of my "Jack the Ripper" narrative … In which they replaced my gruff Dorset police constable with Johhny Depp's Absinthe-swigging dandy. The next film to be made from one of my books was the regrettable "League of Extraordinary Gentlemen"… Where the only resemblance it had to my book was a similar title. The most recent film that they have made of mine is apparently this new "V for Vendetta" movie which was probably the final straw between me and Hollywood. They were written to be impossible to reproduce in terms of cinema, and so why not leave them simply as a comic in the way that they were intended to be. And if you are going to make them into films, please try to make them into better ones, than the ones I have been cursed with thus far. Photography because of its causal relationship to the world seems to give us the truth or something close to the truth. I am skeptical about this for many reasons. But even if photography doesn't give us truth on a silver-platter, it can make it harder for us to deny reality. It puts a leash on fantasy, confabulation and self-deception. It provides constraints, borders. It circumscribes our ability to lie — to ourselves and to others. What I had noticed is that there weren't a lot of women lining up to see a comic book movie, but they were going to line up to see The Devil Wear Prada, which may have been something I wanted to address. But when you're making a movie, you're not thinking about that stuff, you're thinking, 'Wow, I want to make a romantic movie that harkens back to the Richard Donner movie that I loved so much.' And that's what I did. Director Bryan Singer Hollywoodreporter "Bryan Singer: Why 'Superman Returns' Didn't Work", The Hollywood Reporter, April 17, 2011. Well, Jack Warner may have been celebrated for calling writers "Schmucks with Underwoods," but 20 years earlier, Irving Thalberg … said that "The most important person in the motion picture process is the writer, and we must do everything in our power to prevent them from ever realizing that." Steven de Souza in the documentary Dreams on Spec. From the 1960s, cinema was one of the most important aspects of the alliances between Cuba, the USSR and African liberation movements. Filmmaking - both documentary and fiction - in support of rebellious causes were emerging across the world, from Palestine to Latin America, and young members of guerrilla movements such as the PAIGC's Flora Gomes and Sana Na N'hada were sent to Cuba to learn the language and techniques of Third Cinema, the values of revolution and social justice of which echoed the early, utopian ideals of African anti-colonial struggles. Ana Naomi de Sousa, “Between East and West: The Cold War's legacy in Africa”, Al Jazeera, (22 Feb 2016). Steven Spielberg, in an interview by the Brazilian magazine Veja (1993). Francois Truffaut interview in Peter Graham's The New Wave (1968).